Disordered eater or awkward eater? A recent Daily Mail article* quotes American Psychologist Dr Mark Borigini who claims that following a gluten free diet is often used as “another channel for a bigger problem - like an eating disorder”. Last year singer Miley Cyrus hit the headlines when she used Twitter to counter suggestions of anorexia. Her gluten free diet and weight loss had been targeted as possible cover ups for an underlying eating disorder. Of course, similar accusations have been levelled against vegetarian** and vegan diets. More recently, raw food diets have in some cases also been tarred with the obsessive eating disorder brush. All of which is tiresome for everyone whose food choices are based on a genuine belief in the benefits of their diet. Now you don’t need to be a psychologist to recognise that an unhealthy desire to restrict food intake on the one hand, and following a diet that limits food choice on the other, can become blurred at the edges. The need to conceal disordered eating in order to maintain control of a very restricted diet is one of the hallmarks of anorexia nervosa. Sadly the medical and dietetic scientific literature is full of examples of those who have gone to extraordinary lengths to conceal the fact that they are wilfully starving themselves. The Daily Mail article quotes a young woman who on the advice of a doctor started to follow a gluten free diet that then, because she lost weight and was congratulated for doing so, led her to develop an eating disorder. She states that “Ultimately, my gluten-free diet became a weird space I put emotional baggage into”. The idea that a gluten free diet (or indeed vegetarianism) somehow causes eating disorders is a much more damning notion than that these diets are manifestations of eating problems. It does seem sensible to bear in mind the possibility of an eating disorder if a family member or close friend shows symptoms of rapid weight loss that coincide with the change to a gluten free or other restricted diet. One of the common denominators for people with an eating disorder is the absolute need to cover up the true reason for their restricted eating. 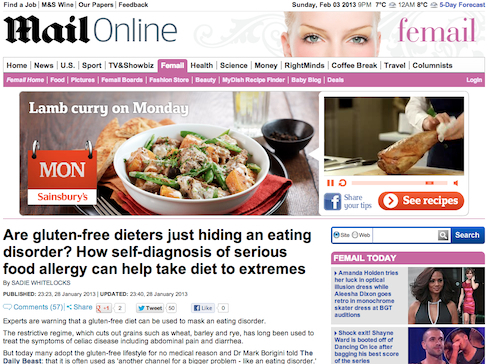 Choosing to declare yourself ‘gluten free’ may indeed be a convenient way of masking a very low calorie intake. After all, no high calorie sauces that contain flour, few carbohydrates and virtually no puddings, will all be perfect anorexic fare. At Awkward Eaters, our feeling is that if someone is actively seeking out restaurants and other food outlets where a gluten free diet is accommodated and welcomed, then the possibility of an eating disorder can be virtually eliminated. After all searching for awkward eater friendly establishments equates to looking for dining opportunities where foods will be available with sauces and dressings, where carbohydrate filled staples like bread, pasta and cakes will be on the menu and where puddings will hopefully abound. This undoubtedly separates the possibly gluten free disordered eaters from the gluten free, but food loving and food seeking awkward eaters. ** A 2012 study published in the Journal of the Academy of Nutrition and Dietetics found that women suffering from eating disorders are four times more likely to be vegetarian than women without eating disorders.